Estela is an award winner Professional Belly Dance Performing Artist, Choreographer, Instructor and Belly Dance Costume Designer based in Las Vegas Nevada. She also earned Belly Dance & Group fitness training certifications from recognized fitness schools such as AFAA & Zumba® and Intensive Belly Dance training courses. 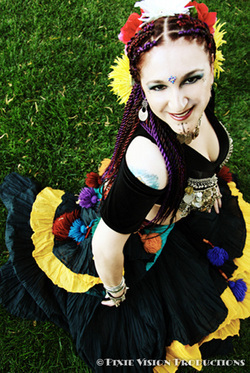 Farasha is an international and domestic Oriental Bellydance Artist and Instructor. She has studied and performed various dance styles and theatre since childhood. 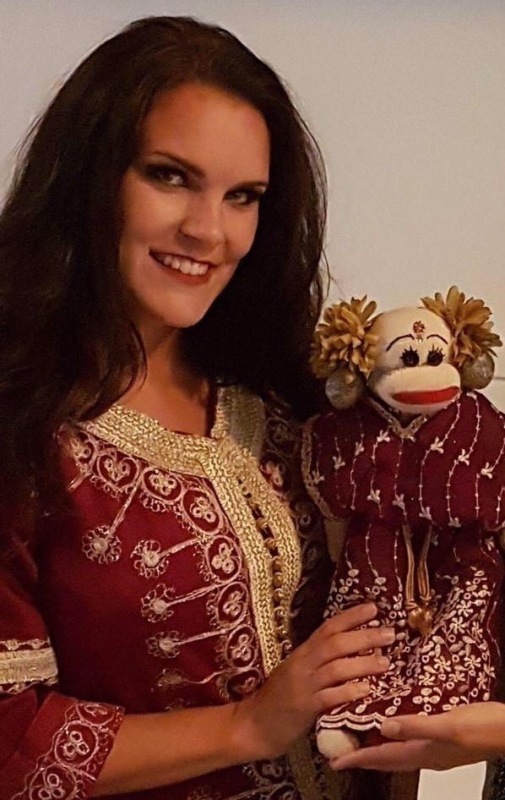 Her passion for performing Middle Eastern Dance was sparked in 1999 when she began studying with New England's premier instructors of Oriental Dance. She became a popular performer in Boston's supper club scene before relocating to Las Vegas after landing a performance contract at Desert Passage/Aladdin Hotel. Her vision is to bring back the sacredness to belly dance, honoring the divine feminine in every woman through the most natural way a woman can move. Lil’ Aziza started her performing career in gymnastics. She wandered through dance forms, starting with tap and ballet, Irish step dancing and, after a brief stop in guitar, found belly dance. She has been dancing for over 20 years. She has studied with Marliza Pons, Aziza of Las Vegas, Fatiem, Aradia, Kahjira, Anya Tribal, and many others. She currently dances with Sudaa’ Nar Fire Tribe. She also solos when the opportunity allows. Her specialty is fusing today’s current songs with a cabaret flare and adding fire to the mix. Mari is a professional Belly Dance Performing Artist and Instructor. She has performed in various events and festivals in Las Vegas. Her dance is elegant with mystic motion blended with powerful energy, and mesmerizing technique. She captivates her students letting them experience the beauty and mystery of Belly Dance. She started her dance training in 2005 at the Silver Mesa Rec Center where she discovered her passion for Belly Dance. After many years of developing her skills Mari began teaching for the City of N. Las Vegas at the Silver Mesa Rec Center and at her Private Studio in 2012. She keeps her dance education and training through seminars, workshops and master classes with the most sought after Master Instructors. Currently she is teaching beginners and intermediate belly dance classes, tribal fusion, basic veil work & sword balance. All classes taught by Raven Sumner, FatChanceBellyDance® Sister Studio and ATS® Teacher Certified instructor since 2009. Raven is licensed and insured. Sister Studios are graduates of General Skills for ATS®, ATS® Teacher Training. These teachers are dedicated to presenting ATS® as created and developed by FatChanceBellyDance® director and master teacher Carolena Nericcio-Bohlman. Sister Studios do not blend ATS® with other styles of dance, tribal or otherwise.They present ATS® only, or clearly separate ATS® from the other styles of dance they are presenting.Our goal is that you, the student, should be able to attend an FCBD® ATS® class anywhere in the world and receive consistent, quality instruction. Photo credit to Brooks Peterson of Las Vegas, Nevada! Shari has a well rounded background and incorporates ballet, musicality, rhythm, and choreography in her dance style. 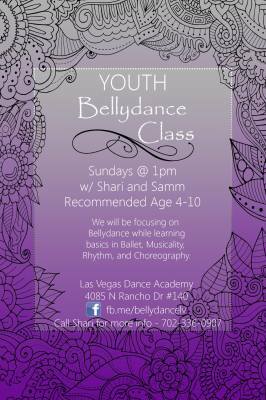 She teaches both adults, and most recently opened a class for the youth ages 4 to 10 years old. ​​​​She is a founding member of Vegas Raqs who brings prominate dancers to Vegas from all over the world!! Shifting Sands Belly Dance is a non-profit organization dedicated to educating and promoting the awareness and appreciation of Middle Eastern and North African dance and culture. Their activities include, but are not limited to, learning belly dancing and Middle Eastern drumming, and participating in various community events. Classes are held at the Clark County Library on Flamingo. Learn various techniques in drumming, finger cymbals, and dance. The dance forms are taken from Middle East and North African folk dances, cabaret style dances, tribal movements, folkloric steps, and fusions of other various styles. Dance in any form presents a challenge in concentration and discipline, but can enhance physical skills as well. The instructors try to make the dance enjoyable as well as educational.